When Mike Lustig began his career with Amtrak in 1978, Chicago was the busy hub for midwestern and western services - and remains so today. Mike Lustig retired as a customer service representative at the Whitefish, Mont., station in October 2015, following 37 years with Amtrak. Whitefish is the busiest Amtrak station in the state; more than 47,000 people began or ended their journey there in Fiscal Year 2015. Before heading for retirement, we asked Lustig to share some thoughts on his long career in railroading. 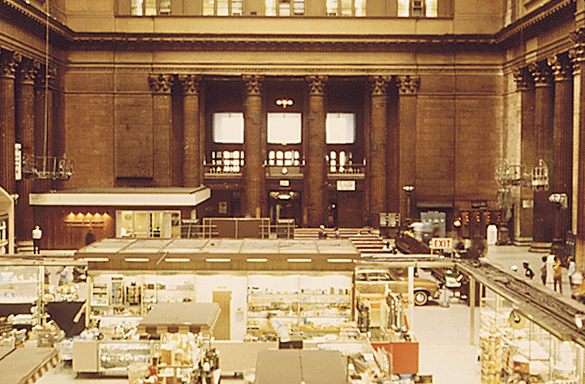 Amtrak consolidated all Chicago-area services at Union Station in 1972.
seating. Image by Charles O'Rear, courtesy of the National Archives. Lustig’s interest in railroads began at a young age while growing up in Chicago, considered one of the most important freight and passenger rail hubs in North America. It’s hard to go too far in the Windy City before running into a set of railroad tracks. Seeing a great variety of freight, intercity and commuter trains was a part of daily life. Lustig recalls, “My dad used to say, ‘You’ve been talking about trains since you were four.’” As a little boy, Lustig also took periodic trips with his family to Havre, Mont., aboard the famed Great Northern Railway (GN) Empire Builder (Chicago-Seattle/Portland). This exposure to railroading led Lustig to Amtrak in March 1978 where he started at the Chicago Reservation Sales Office. Amtrak had opened the Chicago Reservation Sales Office in October 1971 to make it easier for customers to get information about trains, fares and accommodations. 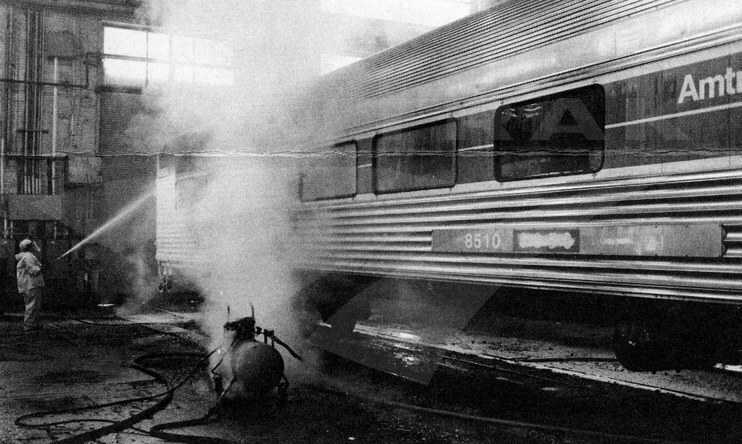 Prior to the establishment of Amtrak-staffed offices, a passenger had to deal directly with those run by the private railroads that still provided train, engine and onboard service employees to Amtrak (these positions were gradually assumed by the company), which had taken over the majority of the nation's intercity passenger rail services in May 1971. 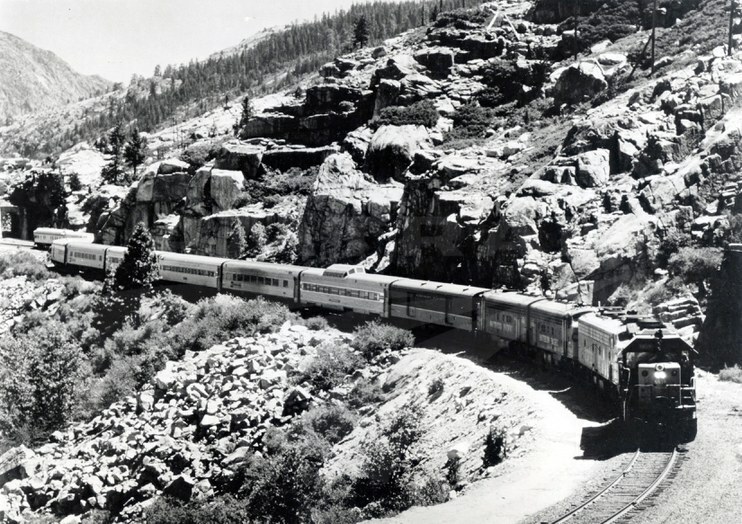 The San Francisco Zephyr snakes through Emigrant Gap in California's Sierra Nevada Mountains. 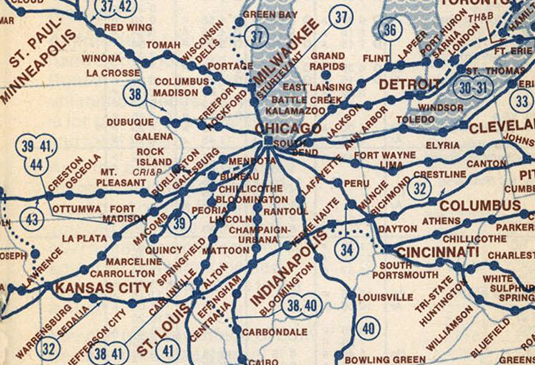 From Chicago, if you wanted to take a train to St. Louis, you called the Gulf, Mobile and Ohio Railroad; a train to Los Angeles meant ringing the Atchinson, Topeka and Santa Fe Railway; and so on. The opening of the Chicago office finally let a passenger, by dialing one phone number for the entire metropolitan area, easily make a reservation for any destination in the country. In the meantime, Amtrak worked to create a computerized nationwide reservation system. “I got to work with former Illinois Central Railroad employees who came to work for Amtrak. While I was in Aurora (which was closed in April 1985 when the stop shifted eastward to Naperville), Train Nos. 5 & 6 were the San Francisco Zephyr (Chicago-Cheyenne-Oakland/San Francisco).1 The westbound Illinois Zephyr (Chicago-Quincy), Train No. 347, ran ahead of the westbound San Francisco Zephyr, No. 5, by about 20 minutes. The tower operator at Aurora would call when No. 347, followed by No. 5, went by Downers Grove. This meant the train was 17 minutes from Aurora. A dozen minutes later, we announced train No. 347, and the passengers went through the tunnel under the track and up the stairs to the middle main platform. Soon thereafter we announced the San Francisco Zephyr and went to meet it. of new bi-level Superliner equipment. A year after Lustig joined Amtrak, the company introduced new bi-level Superliner equipment for use on western national network trains. Manufactured by the Pullman-Standard Company in Hammond, Ind., the Superliners were the first cars designed entirely to Amtrak specifications. Pullman Standard won a contract that, as amended, called for production of 102 coaches, 48 coach-baggage cars, 25 café/lounge cars, 70 sleepers and 39 diners. “In October of 1979 the Empire Builder got Superliner equipment and that was a big deal,” remembers Lustig. To mark the occasion, champagne was offered to adult passengers and buttons and other souvenirs were distributed. Earlier in the month, promotional trains with Superliner coaches, a diner and a sleeping car had covered the entire route, stopping at each Amtrak-served community to show off the new face of long-distance train travel. At St. Cloud, Staples and Detroit Lakes in Minnesota, the display train welcomed approximately 5,000 enthusiastic visitors. In Part 2, Lustig heads west to Montana to serve at stations along the route of the famed Empire Builder. 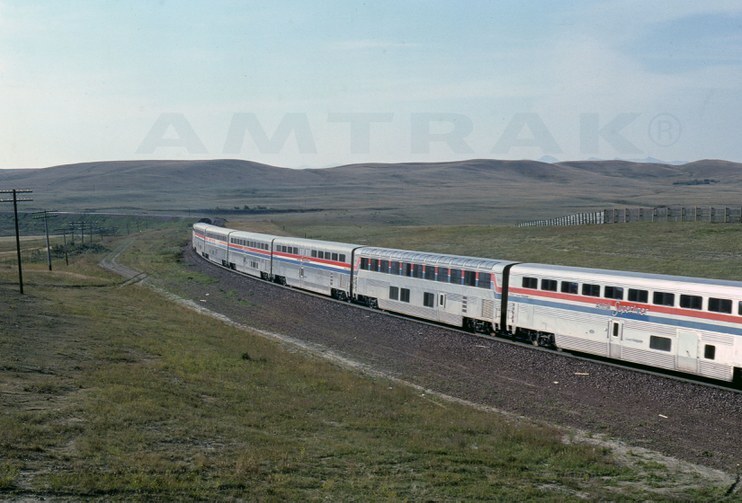 1 In July 1983, the San Francisco Zephyr was rerouted from southern Wyoming onto the Denver and Rio Grande Western Railroad (D&RGW) line between Denver and Salt Lake City. By that time, the D&RGW had decided to turn over its Rio Grande Zephyr - the last privately operated intercity passenger train in the country - to Amtrak. Amtrak preferred the D&RGW route due to its breathtaking scenery along the Colorado River. To mark this transition, Amtrak renamed the train the California Zephyr, a name it retains today.